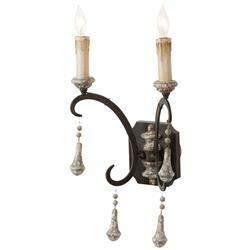 Antique ambiance is easily achieved with this elegant French Country candelabra wall sconce. A handsome heraldic plaque mounts to the wall, where double arm outstretches to hold twin lights. Weathered, painted wood beads dangle delicately from the curved, rusted base.